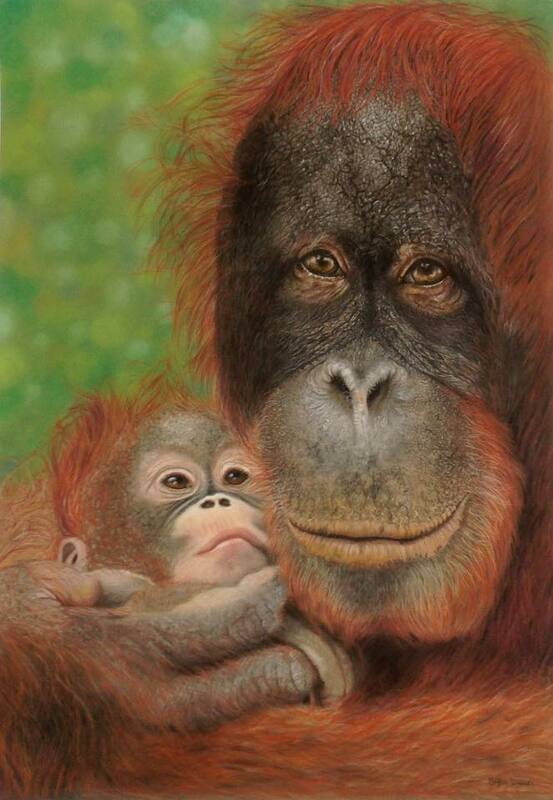 The winner of the vote for best picture at the spring exhibition is ‘Protecting our future’ by Hayley Walker, a stunning pastel with great detail. Congratulations to Hayley, who also won the prize for best Craft stall with her display of felted animals and Bears. It was a great exhibition of our members work with a huge variety of styles and media, we were pleased to hear how difficult our visitors found it to vote for a single winning picture! Crafts displayed included papercraft, soft craft and clay craft and provided a colourful backdrop to the pictures exhibited. 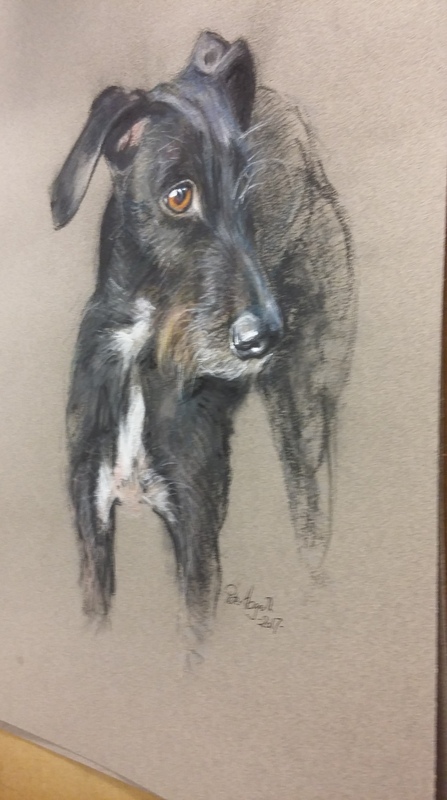 Lurcher in Pastel by Peter Hogarth – work in progress! The Fair Oak Art and Craft Society welcomed Peter Hogarth for the February Art Demonstration. Sheduled to appear in March he kindly stepped in at short notice and entertained us with his Pastel portrait. Peter works full time as a portrait artist using pastels to capture our favourite pets! He likes to meet the pets if possible, and this gives him an insight into their character which he can then capture in his portrait. It takes a day or two to complete a picture, but as you can see from the picture above he made a good start in the two hours he had with us. He started with a prepared sketch and layering on the tones of the picture with white and black before moving on to the colours. 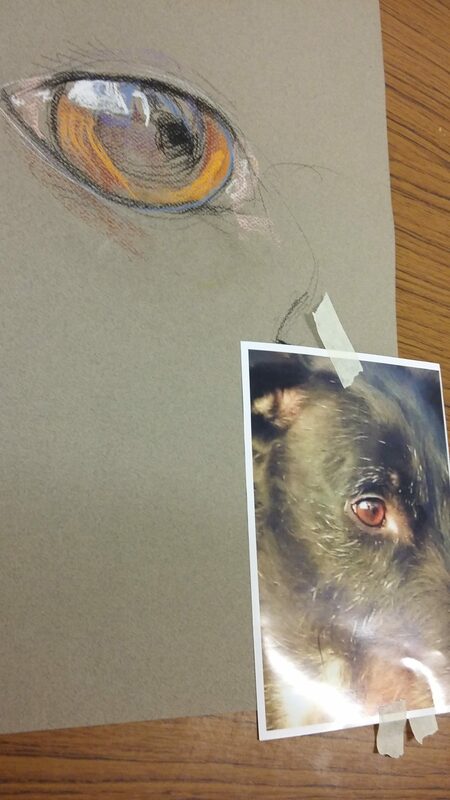 Peter also paused to show us how to get the detail of an eye, he took his photograph and used the pastels to paint the eye of the dog, showing shape and highlights which make the eye come to life. A brilliant demonstration, he talked as he worked and the Lurchers Portrait was coming along nicely by the time we had to close for the evening.